The FDA is required to publish a reference called — Approved Drug Products with Therapeutic Equivalence Evaluations — commonly known as the Orange Book(OB). 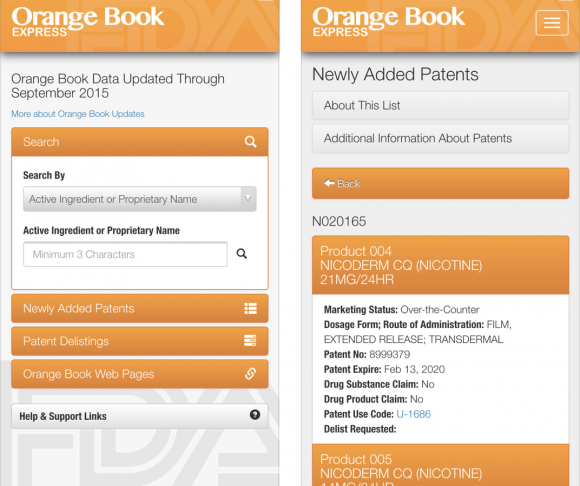 The Orange Book has many purposes, but some of them are to promote the use of generic drugs and to list the patents of various drugs and when they run out. The online version of the Orange Book isn’t the most user friendly. The mobile app versions of the book are much easier to use. If you utilize the Orange Book frequently (most physicians do not), then you’ll probably prefer using the apps. The FDA’s app is free to download and is available for the iOS and Android platforms.